Due to the perimeter of the lake, which is almost 160 km, there is something to do for everyone. Whether you want to take active walks or stroll through the villages and sit on as many terraces as possible: this is the destination that you were looking for. 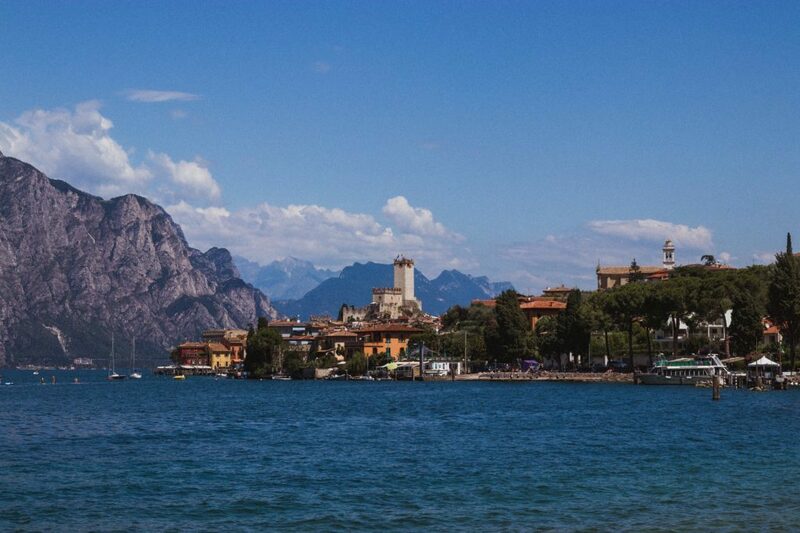 Discover the most beautiful villages of Lake Garda! Did you know that this is the largest lake in Italy? Discover it! 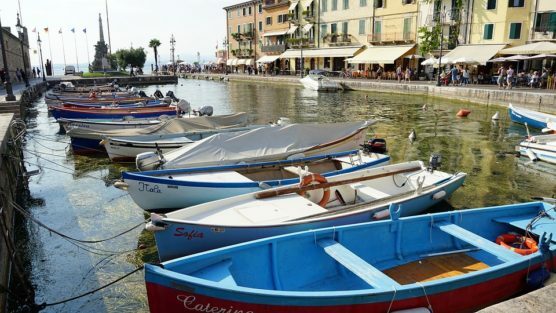 One of the most popular villages of Lake Garda, and there’s a reason for it. The impressive, medieval castle (Castello Rocco Scaligera) on the lake attracts thousands of visitors each year who say, it’s like being in a fairytale. From this castle, you will discover a breathtaking view of the village and Lake Garda. Sirmione’s 16th-century center, Centro storico (the old town), is also a must-see. Here you will find the beautiful church of Santa Maria Maggiore and the square Giosuè Garducci with old and historic monuments. ❧ Tip 1. Explore this area in the afternoon and try one of the many delicious pizzerias or bars on Piazza Giosuè Garducci . 🍕 Sirmione is the answer to where to stay in Lake Garda! 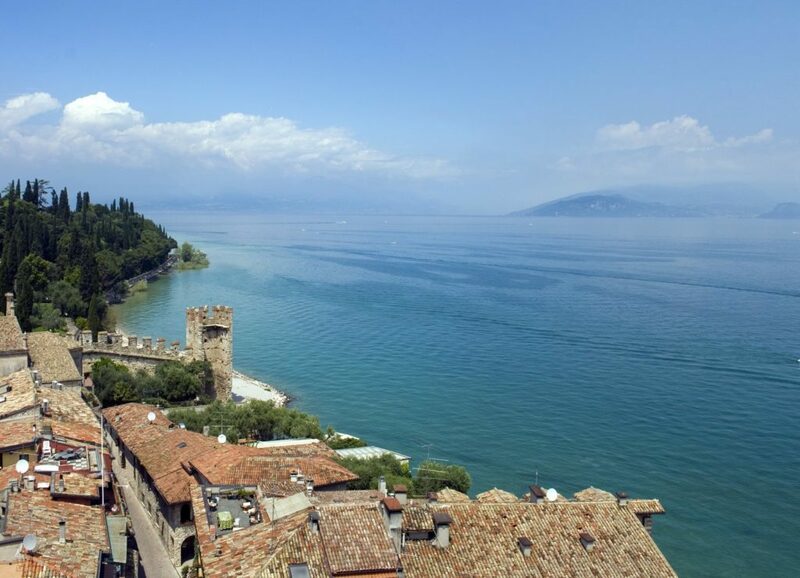 Stay in Sirmione and discover the many historical monuments. In the Tremosine area, in the western part of Lake Garda, opposite the mountains, you will find ¨l borghi più belli d´Italia¨ – the most beautiful villages of Italy. There you can drive through the winding country roads from village to village. Often these populations consist of no more than a few houses. The largest village in this area is Pieve, with perhaps the best views of the area. In this village, with a medieval center, you will find the so-called ¨terrazzas¨ – where you can look 400 meters down steeply, along with the rock walls. Tremosine stands for rest and relaxation, and you can enjoy beautiful views over the lake and the other villages, the higher you climb, the better it gets. 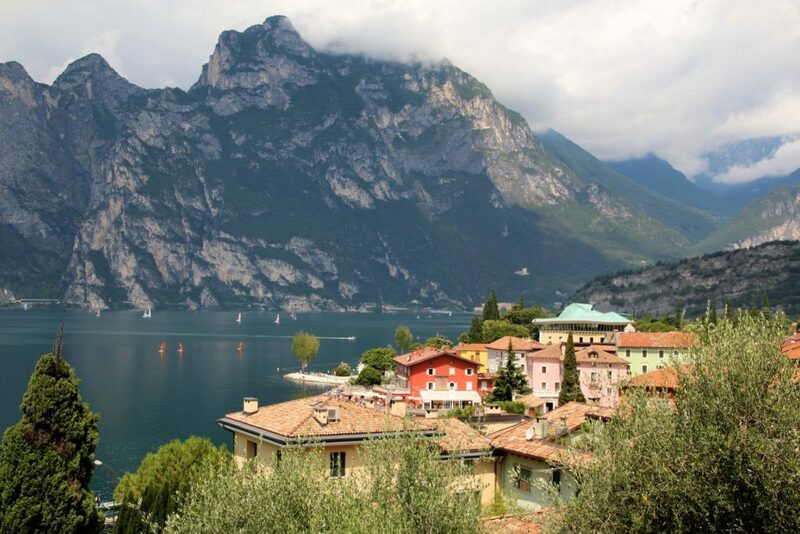 If you wonder where to stay in Lake Garda, Tremosine is a perfect option! Be enchanted by Lake Garda in Tremosine. Here, you have the feeling that you went back in time. This is the history buff destination. A medieval city-fortress surrounds the old town. If you aren’t impressed yet, you must visit the old port of the village. This cute little harbor with terraces on both sides is the Italian décor that you are craving for. This village was built on the slope of a mountain. Due to its location, it used to be more isolated. Thanks to the better infrastructure, it is now more accessible, but the charm of a small Italian village still remains. The inner part of the town is a maze of narrow, flowered alleys full of cute boutiques. The old center dates back from the Middle Ages and here you can find many attractive squares full of terraces and old churches. 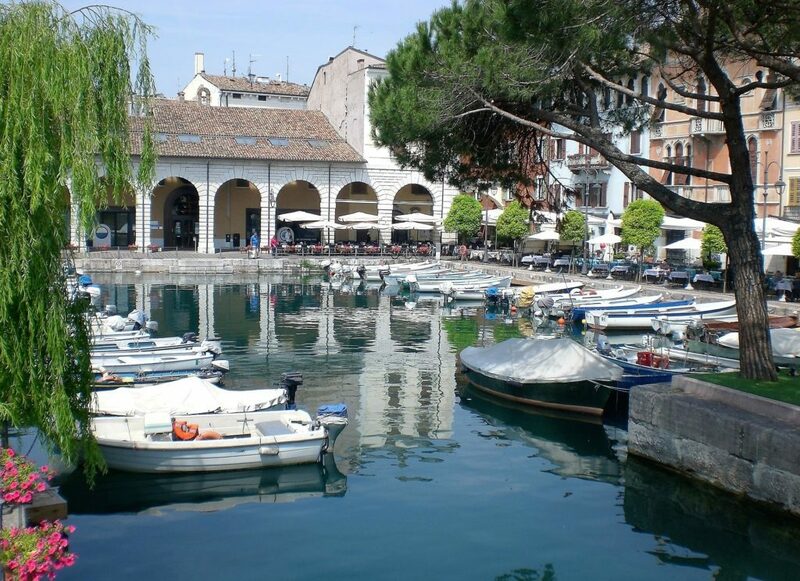 Desenzano has another advantage: it is close to Verona! Did you know that this city was the romantic backdrop of Romeo and Juliet? However, it has much more to offer, for example, visit one of the historical monuments such as the amphitheater. Enjoy the ultimate family vacation in Desenzano. Less known than the rest, but certainly not less beautiful, in fact, this is perhaps the most beautiful village. It retains its charm and isn’t crowded. Located to the north of Lake Garda and in the middle of a mountain landscape, visitors can choose from a wide range of activities but it’s especially suitable for wind and kite surfers. The old center dates back from the 15th century and is extremely charming. Walk through the old fishing village with narrow streets full of 15th-century buildings, where you can still experience the magic of the past. Are you already preparing your suitcase? This destination is a guarantee for a relaxed holiday. Experience this romantic place with your loved one or stick to an active family holiday, with the Lake Garda towns we’ve listed for you. Not only that, but you will also enjoy wonderful weather and amazing nature, the options are endless. If you want to know more about it rather than just where to stay in Lake Garda, read our travel guide. 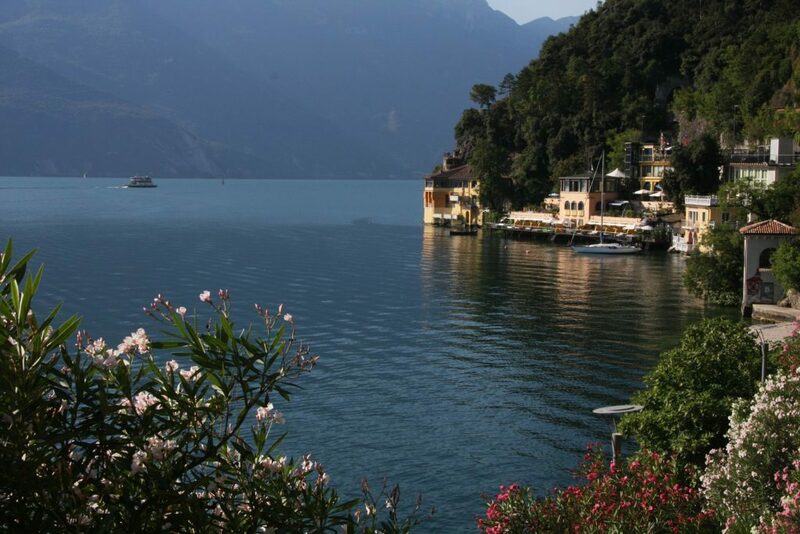 Another two-hour drive from Lake Garda is Lake Como, a little more exclusive and just as breathtaking. If you visit Lake Como: you should not miss these places.